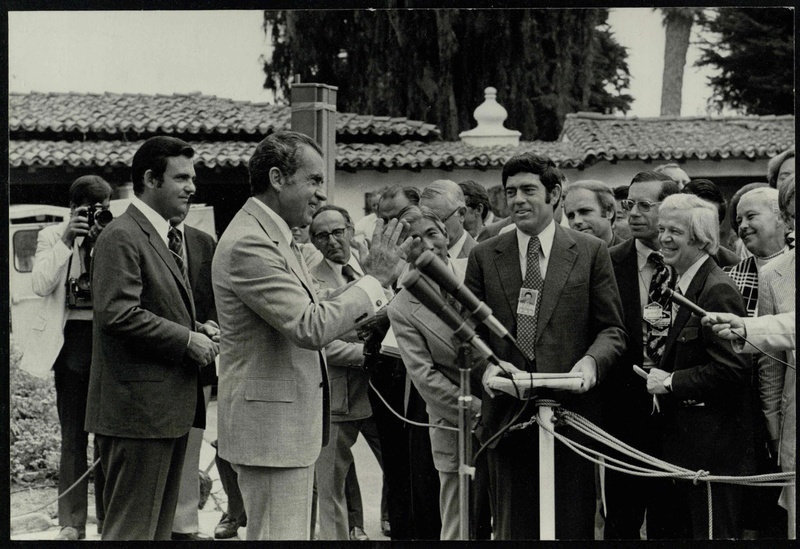 Picture – Nixon talks to the press during his 1972 China trip. Rather (Dan) Papers, Box 82_0046, Howard Gotlieb Archival Research Center, Boston University. Dan Rather has been reporting about and commenting on U.S political affairs since his first columns as the editor of the Houstonian in 1952. As the news director at KHOU in Houston, he traveled with his first president, Dwight Eisenhower, in 1960. He worked as the CBS White House correspondent from 1964 to 1975, when he closely followed the Johnson and Nixon administrations and reported on the Watergate scandal. During that time, he traveled extensively with both presidents across the globe. Rather also wrote a radio column entitled First Line Reports, the CBS Radio News series that ran Mondays through Saturdays typically about 06:30 am.